Continuing the Legacy: After Eliza took over her mother Sally Seymour’s shop and married free mulatto tailor John Lee, the couple expanded the business, catering for such associations and events as the Society of the Cincinnati meetings and the Jockey Club Banquet during Race Week, as well as owning and operating four boarding houses. Leading the Way: Sally ran a cook shop at 80 Tradd Street, becoming Charleston’s first caterer to gain city-wide acclaim. Théonie Rivière Mignot Rutjes was a part of the French influence that established Charleston’s coffeehouses, confectioners, and ice-cream gardens. Parisian Style: Théonie and her husband, Adolphus Rutjes, operated The Mount Vernon at 174 King, later expanding it to include a candy store, a restaurant, and an outdoor ice-cream garden. Every member of these dynasties was trained as a pastry chef in the French style. They knew how to handle dough, confectionery, and sugar baking, as well as the making of savory dishes. They performed on cook stoves rather than hearths, so they had the temperature control to prepare delicate sauces and braise meats low and slow. While all of them oversaw an eating establishment, their fame derived from catering banquets for the many clubs, societies, and associations in the city. Then as now, Charleston’s social life was organized around the diversions of these organizations. The city’s first renowned caterer, Sally Seymour, was the slave mistress of planter Thomas Martin and mother of his children. 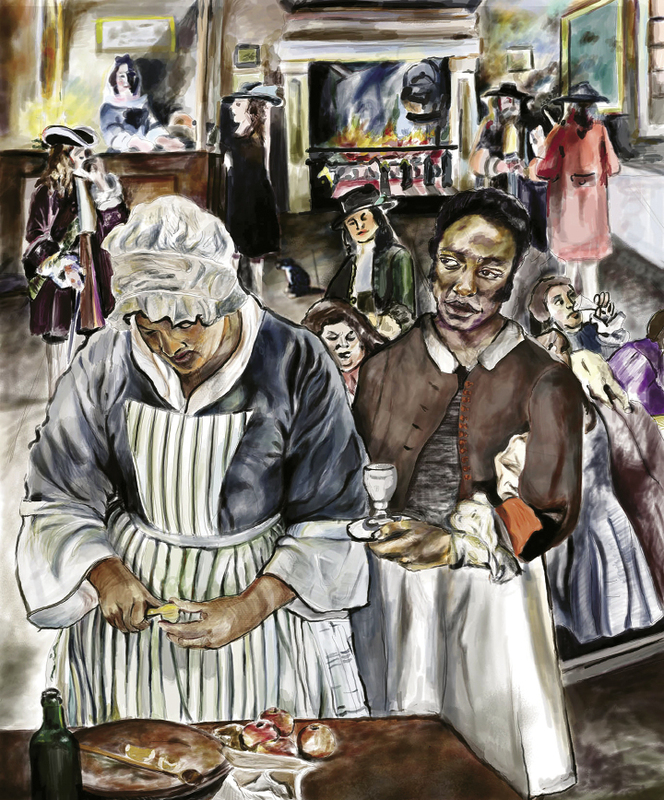 He manumitted her in 1795 and, as a free woman of color, she set up a cook shop at 80 Tradd Street under the name Sally Seymour, which she chose for herself. During the late 1780s, when she oversaw Martin’s house and kitchen, she had been trained in Parisian culinary art by Adam Prior, one of Charleston’s two pastry cooks. This Londoner’s skill can be judged by his advertisements in the Charleston Morning Post for his shop at 40 Elliott Street: “Rich Cakes, French Pies, Patties, Trifles, every kind of Cut-Pastry, Jellies, and all sorts of Confectionery. Note. Hot meat pies of all kinds.” These were precisely the things that Sally Seymour mastered, eclipsing her teacher in public favor. For 29 years, Seymour’s was the temple of gustatory pleasure in the city. It was at her table that Thomas Grimké, Gen. Charles Cotesworth Pinckney, and Gen. Thomas Pinckney convened the Mutton Chop Club every other Wednesday, talking Federalist politics and rice planting. Seymour’s influence was entirely more profound than as simply a provisioner of fine foods. 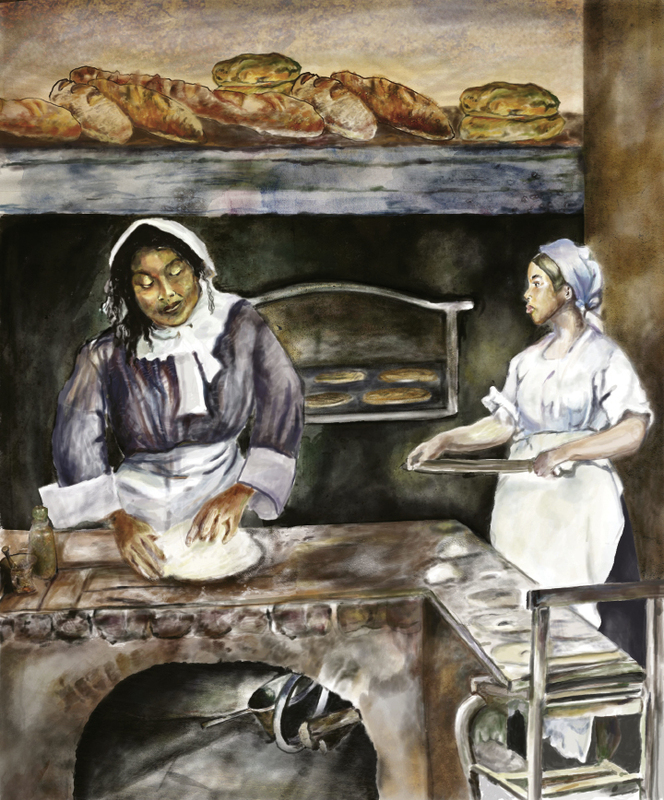 She trained a generation of African-American men and women in the art of pastry cooking. For this reason, Charleston cooked vegetables in the French style—with delicacy—and balanced flavor in dishes (approaches visible in Sarah Rutledge’s cookbook, The Carolina Housewife). Seymour’s own servants—when she sold them—commanded so great a demand as “complete pastry cooks” that they had to be contracted by private auction rather than public vendue. Scores of planters had their kitchen slaves trained by Seymour in a quasi-apprenticeship, not unlike today’s fine-dining stages. She would enjoy the fruits of their labors, while they learned the culinary arts. The cook also taught numbers of the free black women who would become her rivals: Camilla Johnson, Eliza Dwight, Martha Gilchrist, Cato McCloud, and the Holton sisters. Her greatest disciples were her own children, William and Eliza. After Seymour’s death in 1824, her daughter Eliza assumed control of the shop and married John Lee, a free mulatto tailor whose business was located nearby. Lee—a member of the Brown Fellowship Society, the association of free African-American elite—possessed substantial business acumen and the credit of the network of African-American artisans and professionals. Eliza Lee became the favorite caterer of the city associations. The Society of the Cincinnati met regularly at her establishment on Tradd Street into the mid 1830s. Her greatest efforts were her annual banquets for the South Carolina Jockey Club during Race Week. Given his wife’s talent as a caterer and his own administrative ability, John Lee changed vocations, becoming both a public caterer and boarding-house proprietor. From 1840 through 1851, they collaborated in running four establishments: The Mansion House on Broad Street (1840-’45), the Lee House (1845-’48), the Jones Hotel (1848-’50), and the Moultrie House on Sullivan’s Island (1850-’51). John’s death in 1851 forced Eliza on an independent course. Opening a restaurant at 18 Beaufain Street, she reigned as the matriarch of Lowcountry cooking until she retired in 1861. If Eliza Lee had a female rival as the empress of the Charleston culinary scene, it would have been Théonie Rivière Mignot, the daughter of Baron Jean-Pierre Rivière. He was a refugee of both the French and Haitian revolutions who finally found security in Charleston as a grocer specializing in luxury goods. Born in Philadelphia and educated in Paris, Théonie learned the luxury goods trade as her father’s agent in France. She settled in Charleston at age 22; married French caterer Rémy Mignot, who was 18 years her senior; and spent the first eight years of her marriage mothering. 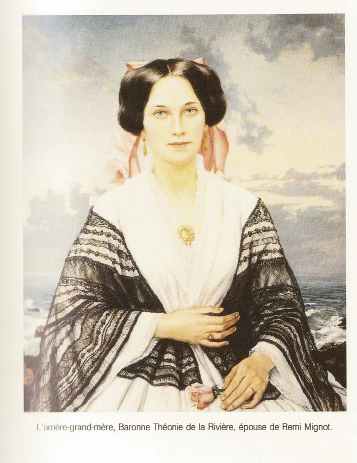 But in 1842, she joined forces with her ambitious husband, the man largely responsible for creating the first Parisian-style restaurant in Charleston—The United States Coffee House at 129 East Bay Street—on January 14, 1837. This establishment promised to supply the public “with all that is rare and delicious, in Fish, Flesh and Fowl... in the style of the Parisian and New York, Restorat,” according to an 1837 ad in the Charleston Courier. After this house collapsed in a partnership squabble, Mignot opened the French Coffee House at 125 East Bay Street and in 1842 his beloved store at 160 King Street. Théonie made 160 King the confectionery dreamland of the South. 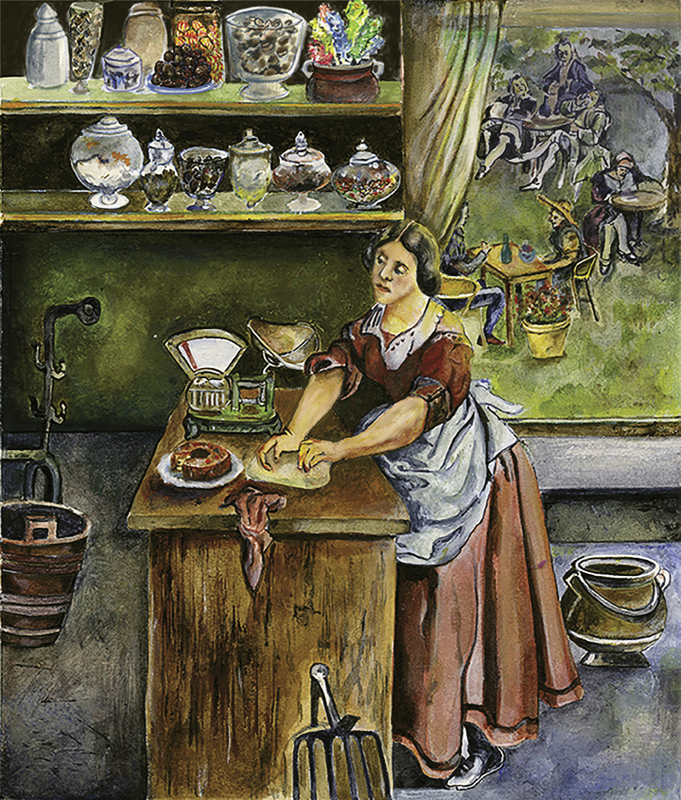 In the summer, she served ice cream; in the winter, she stocked the shelves and displays with all manner of handmade sweets: “Mint Candy, Rock Candy, Horehound Candy, Flaxseed Candy; Sugar Plums: Almond & Coriander, Marble Sugar Plums, Cinnamon & Citron, Burnt Almond, Vanilla Almonds, Lemon Almonds, Preteen Rose, Chocolate Drops, Cherries Crystallized, Raisins Crystallized, Coriander Drops, Cordial Beans, Citronel, Epenvinette, Raspberry Sugar Plums.” When Rémy died of cancer in 1848, she undertook sole management. Two years later, Théonie married Parisian-trained confectioner Adolphus John Rutjes, a family friend. The couple quickly launched The Mount Vernon at 174 King with a seasonal outdoor ice-cream garden. Taverns, inns, coffeehouses, and hotel saloons tended to be masculine spaces, but with The Mount Vernon, Théonie and Adolphus created a space “expressly for the Ladies of Charleston. Gentlemen visiting the Saloon in the company of Ladies will be admitted.” Aided by “the best French Cooks” and “her own personal knowledge and experience,” she offered Parisian fare suited to Carolina tastes: “Mock Turtle Soup, Oysters—Fried or Stewed, Meat and Oyster Patties, Beef Steak, Mutton and Veal Chops, Sardines, Ham and Eggs, Omelette, French Styles Beef Alamode, with Jelly, Cakes, Ice Cream, Coffee, Chocolate.” This temple of Franco-American sweets and savories lasted until the great fire of 1861 destroyed the restaurant and all of the neighborhood around it. Madame Théonie moved to Columbia and eventually to Raleigh, where she and Adolphus launched haute cuisine in North Carolina. Mid-way through the 1850s, Adolphus Rutjes also had decided to be a retailer of game and fowl shipped from the North, having noticed the rapid rise in business and reputation of Nat Fuller, an entrepreneurial African-American broker of wild game. Rutjes did not realize that he was competing with a man of genius intent on expanding his retail meat empire into the catering business. A decade prior, Fuller had become the chief purveyor at the Charleston Game Market at 68 King Street and developed a popular mobile catering business in the early 1850s. A decade later, he would open The Bachelor’s Retreat, the finest restaurant to grace 19th-century Charleston. Game being a premium offering on hotel menus, Fuller befriended the kitchen staffs of the Charleston Hotel and the Victoria, studied their preparations, and mastered high-end cooking. Since the game market only operated from dawn until 10 a.m., he had the remainder of the day to devote to perfecting kitchen craft and prepping society dinners. Fuller was unique, combining the organization of a field marshal, the savvy of a wholesale merchant, the skill of a trained chef, and the social finesse of a career diplomat. He collected talented assistants, including the young African-American pastry cook Tom Tully, who would become his successor and the trainer of most of the black hotel chefs of the late 19th century in Charleston. In autumn 1860, he opened The Bachelor’s Retreat at 77 Church Street, offering “Breakfast, Dinner, Supper, Lunch, and Oysters, served up at any hour and in every style.” What is distinctive about Fuller in the development of Charleston cookery is his synthesis of the French pastry-cooking tradition with plantation and hotel meat cookery. 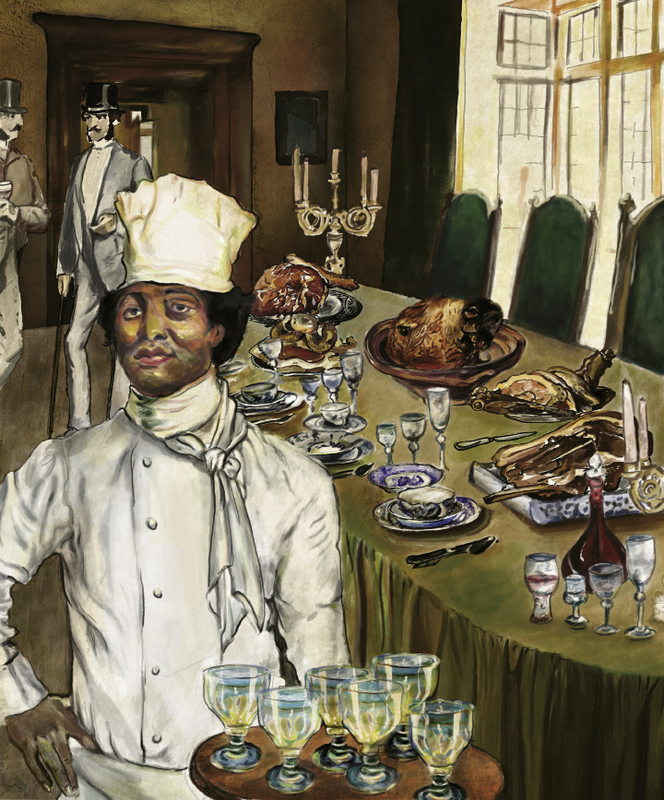 He was the first to insinuate vernacular and African-American influences into high-style cuisine. Today, in the midst of Civil War sesquicentennial remembrances, it might be well to conclude our city’s memorial exercises in 2015 with a restaging of this most hopeful banquet of the first great century of Charleston cooking. Any number of talented Lowcountry cooks could perform as Nat Fuller, 77 Church Street stills stands in all its glory, and recipes for all of Fuller’s signature dishes exist. Let the planning begin!